Hillary Clinton&apos;s march to the White House is starting to run into some speed bumps. A new Bloomberg poll out today shows the former first lady and secretary of state with consistently narrow leads in a series of head-to-head matchups with leading Republican contenders. Among likely voters, Clinton edges out New Jersey Governor Chris Christie, former Florida Governor Jeb Bush and 2012 Republican nominee Mitt Romney by 6 points each. Sen. Rand Paul (R-Ky.) trails by 8 points, while Sen. Ted Cruz (R-Texas) brings up the rear, losing to Clinton by a wide 46% to 33% margin. The apparent romp continues when the questions turn more personal. Pitted against each of the five Republicans, Clinton was deemed a "stronger leader," who is more likely to "share your values" and "care about people like you," while also having a better "vision for the future." But a closer look at the underlying numbers show that Clinton&apos;s support might not be as impenetrable as it appears at first glance. Not all good news: As Bloomberg accurately notes in its assessment, Clinton&apos;s margin of victory is relatively slight on the question of who more "cares about people like me," where she leads opponents by an average of 13 points. By comparison, President Barack Obama beat Mitt Romney, the 2012 GOP nominee, by 63 points on the same question two years ago. When asked if they had a "favorable" view of the potential candidates, Clinton&apos;s lead with likely voters is accordingly tenuous. While she tops the poll with a 52% favorability rating, there isn&apos;t much room to grow. Only 6% are "not sure" what they think of Clinton. By contrast, 31% were "not sure" what to make of Bush. Paul, at 39%, and Cruz, at 45%, are virtually unknown to voters. Clinton, as much as any other political figure of this generation, knows how quickly those mystery men can gain notoriety and support. At this point in 2006, she led a freshman senator named Barack Obama by 11 points. Experience is both a positive and a negative: The question of how the public views Clinton&apos;s "past experience" as secretary of state and first lady is particularly murky. Bloomberg declares that she "would enter the presidential race with positive views of her past experience and personal traits," but a closer reading of the poll questions suggests something very different. Consider the construction of the question posed to the poll&apos;s respondents: "I&apos;m going to mention some things about Hillary Clinton. For each, please tell me if you see it as more to her advantage or more to her disadvantage." When asked to react to the statement, "She has lived in Washington and worked in the federal government," 78% say that this would be to Clinton&apos;s advantage. Those are eye-catching numbers. Bloomberg concludes from this that nearly 8 in 10 voters take Clinton&apos;s deep connection to the chronically unpopular capital as a "positive." But the question doesn&apos;t allow for voters&apos; personal preferences on the issue. Instead, it asks how respondents believed the fact would affect Clinton&apos;s potential candidacy. "The question was asked immediately after match-ups with potential Republican candidates for the 2016 contest," J. Ann Selzer, whose firm conducted the poll, told Mic in an email. "Our intent was whether it will help her get elected or be used against her." 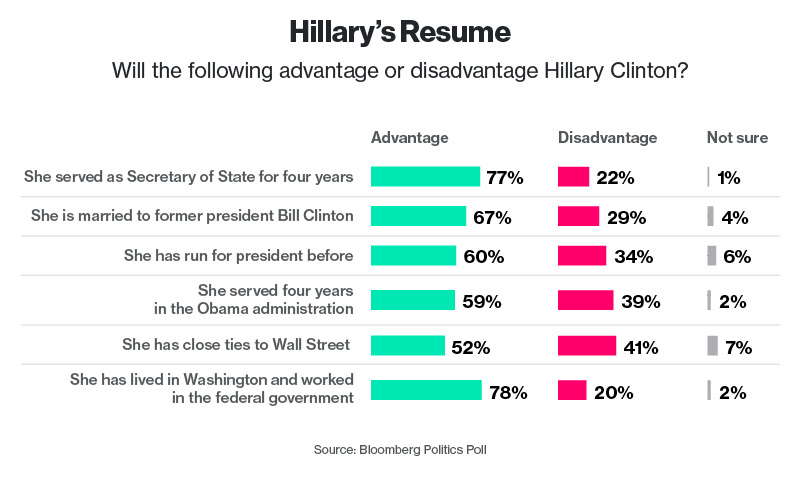 By that definition, respondents could have very well believed Clinton&apos;s many years in Washington, D.C. — some of it overlapping with her time serving as secretary of state (77% advantage), or "close ties to Wall Street" (52% advantage) — simultaneously made her a less appealing candidate and one more likely to win election. But just as there is time for the Republican contenders to make their names known outside Capitol Hill or their home states, so too is there room for Hillary Clinton to shade her public perception. Her team would be wise to read this new poll for what it shows and not what the headlines around it shout. Clinton has a solid half of the country in her corner. The fight for that 1%-2% of her eventual opponent&apos;s pie will be her defining challenge.